We always love these type of cross game mash-ups. 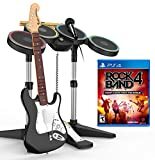 Fallout 4 and Rock Band 4 have absolutely nothing in common besides being the 4th installment in their respective game series, but Harmonix and Bethesda have somehow found a way to work some Fallout into Rock Band. When the Rock Band 4 title update rolls out on December 8th, it will include a free Fallout 4 Vault 111 suit (complete with Pip-Boy) as a character creation option. Definitely a neat touch for fans of one or both franchises. Take a look at the trailer showing off the suit and character creator. To celebrate the blockbuster success of Fallout 4, Harmonix Music Systems, Inc. and Bethesda Game Studios today announced that the Fallout 4 Vault 111 Suit will be added to the character creator in Rock Band 4 for both Xbox One and the PlayStation 4 computer entertainment system. Players’ in-game avatars can rock their way through the apocalypse sporting the Vault 111 Suit, complete with the music-reactive Pip-Boy, when the free Rock Band 4 title update launches on December 8th.